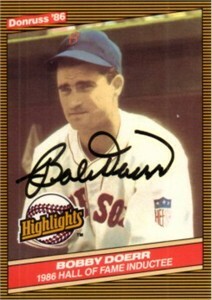 1986 Donruss Highlights card commemorating Boston Red Sox star Bobby Doerr's Hall of Fame Induction, autographed in black marker. With certificate of authenticity from AutographsForSale.com. ONLY ONE AVAILABLE FOR SALE.